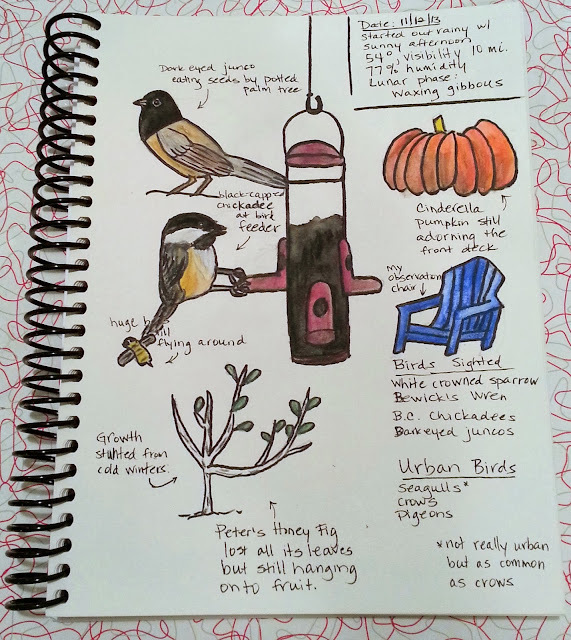 I've been really getting into backyard birdwatching since I read the book Urban Bestiary: Encountering the Everyday Wild by Lyanda Lynn Haupt last month. In fact, I followed the author's advice and moved one of our deck chairs into a spot close to the birdfeeders so I can get in on the action. She suggested spending time quietly sitting in nature to observe all that's going on around you. What this means is that the birds, bugs, bees and critters start to look at you as part of the landscape and pretty much carry on business as usual, ignoring you in the process. The end result is that you get to become part of their habitat. It's a much different experience than witnessing it behind glass. You get the sound of wings quickly flapping. Which, for chickadees (and hummingbirds), is a lot louder than you'd expect. The author also mentioned keeping a phenology notebook. Yeah, I never heard of that either. It's basically the study of periodic plants and animal life cycle events and how these are influenced by seasonal and interannual variations in climate (thanks Wikipedia). So, how to go about doing this? One way is to keep a Nature Journal. My goal for today was to capture basics about the weather and season and what's going on in the front yard. I also wanted a space to write down what birds and other critters I spied during the day. Have you ever written a Nature Journal or something like it? If so, what kinds of details did you include? Warning: there be affiliate links in this post that, when clicked, may provide meager kickbacks to help support this here blog. Delighted to see you posting. I was thinking about you today while visiting mom at the hospital. Your earlier posts about the amount of plastic waste made in the medical industry was forfront of my mind. Due to a serious injury last year, I spent a lot of time sitting on a couch, staring out the window. We have a birdfeeder hung at that window and I grew to love watching the birds and their antics, learned to identify them and look for them at certain times of the year/time of day. Now that I am back on my feet, I've retained my love of birds. I try to sneak into the garden to watch them, have planted many more natives to attract more birds, butterflies, bees and bugs. My blood pressure goes down and I feel more connected. I should try a journal like yours - but dang, I'm pretty impressed with your drawings! Very nice. This is really cool and inspirational. I'd love to do something like this with my kids.